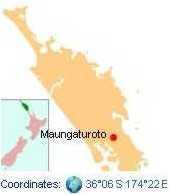 Maungaturoto is a small town in the Northland Region of New Zealand. The population was 837 in the 2006 Census, an increase of 87 from 2001. It is the second largest settlement in the Kaipara District. The township is located close to the Otamatea River, an estuarial arm of the Kaipara Harbour 25 kilometres north of Wellsford and 45 kilometres south of Whangarei. Maungaturoto also has its own motocross club (http://maungaturotomc. co.nz) where members regularly meet. Five kilometres southeast of Maungaturoto is the antipodean point of Gibraltar. The school celebrated its 40th reunion in 2006. The District High School was established in Maungaturoto in 1939. Maungaturoto School is a contributing primary (years 1-6) school with a roll of 206. A school first opened in Maungaturoto in 1874. Otamatea Christian School is a private composite (years 1-13) school with a roll of 39. It is a ministry of the Maungaturoto Congregational Church, and is waiting on Ministry of Education approval to become a satellite school to Kamo Christian School. All these schools are coeducational and have a decile rating of 6. This page was retrieved and condensed from (http://en.wikipedia.org/wiki/Maungaturoto) see Wikipedia, the free encyclopedia, January 2009. This information was correct in January 2009. E. & O.E.